Video: Mini Modo Parade in Victoria. Best spot to pick up Mexican ingredients in Vancouver. Ever since our members voted to join forces back in January, we've been pondering the best way to mark Modo's official launch in Victoria. What better way than with a parade? 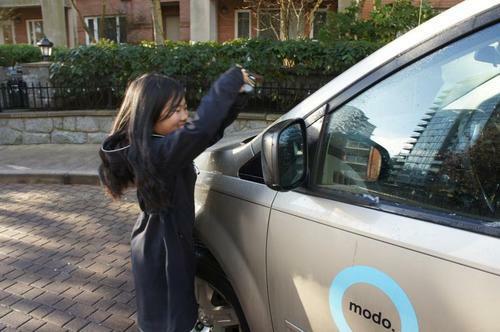 On April 1, member-volunteers from the Island and mainland swapped 23 Victoria Car Share vehicles with new Modos, and added a new location at Bastion Square Parkade. Thanks to everyone who helped us launch our fleet in Victoria! VIDEO: See the parade in action! So, you packed your bag, booked a Modo and you’re ready to go. Now to access the car. Simple as it seems, members new to Modo may find it can take a few swipes before fobbing in and out feels natural. Read our blog post for the 3 Signs of a Successful Fob In and some common reasons why you might be having trouble. For the third year, hobby chefs across Vancouver opened their homes and welcomed hungry diners for a good meal and a good cause. We were happy to partner with #dinnerpartyYVR once again to provide free rides to the after-party – and to help some hobby chefs prep for the big day. Read Jennifer's post about her first-ever Modo trip and where to find some of the best Mexican fiesta ingredients in Vancouver. >> SHOUT OUT Next week is National Volunteer Week, and we think Modo's fantastic member-volunteers deserve an award! >> HOW-TO VIDEOS Booking a stow-n-go van? Or an electric vehicle? Check our How To playlist on YouTube for some tips and tricks. >> WHY I RUN Following a successful, injury-free run at the #Modo8k, Modo member Elinor shares her running story. Inspired by Modo's business model and dreaming of building a social impact business with principle at the heart of what it does? The British Columbia Co-operative Association (BCCA) and Vancity want to give social entrepreneurs a leg up on launching and running their own co-op through Co-operate Now, a co-op business education program. Featuring interactive workshops with local co-op leaders, the program runs May 28–June 1 in Vancouver. Contact cooperatenow@bcca.coop for complete schedule and registration details. Book a Modo and head to Agassiz to take in the scents and sights of the 2015 Tulips of the Valley Festival. Kids 12 and under get free admission. If you can't make it to Agassiz this weekend, why not visit our friends across the border at the Skagit Tulip Festival until April 30? There's now a 2010 white Nissan Versa hatch (#353) instead of a 2008 grey Nissan Versa hatch. Find a 2013 red Nissan Sentra (#416) instead of a 2010 black Kia Forte. You'll now find a 2014 red Nissan Versa Note (#492) instead of a 2008 silver Mazda 3. There's now a 2010 grey Toyota Corolla (#362) instead of a 2007 white Mazda 3. Find a 2012 blue Dodge Journey (#389) instead of a 2008 black Mazda 5. You can find a 2012 red Toyota Corolla (#399) in the Bastion Square Parkade, at the corner of Yates Street and Langley Street. Our stall is at ground level: enter from Yates, turn left, and park in the last "reserved" stall before the ramp. We've placed a 2011 green Mazda 2 (#316) instead of a 2008 blue Honda Civic. Find a 2012 yellow Fiat 500 convertible (#326) instead of 2014 aqua Toyota Prius. There's now a 2012 blue Toyota Prius V (#434) instead of a 2014 red Toyota Prius C.
You'll find a 2014 red Toyota Prius C (#506) instead of a 2014 white Toyota Prius C.
A 2009 blue Nissan Cube (#238) is now located at Cook Street Village instead of a 2010 white Nissan Cube. We've swapped a 2009 blue Nissan Versa hatch (#363) for the 2010 blue Nissan Versa hatch. This location now holds a 2013 blue Toyota Prius C (#455) and a 2014 silver Nissan Frontier (#580) instead of a 2014 grey Toyota Prius C and 2015 white Nissan Frontier. You'll find a 2014 white Nissan NV200 (#565) instead of a 2011 white Ford Transit. This cargo van is subject to Modo's premium rates. There's now a 2014 silver Nissan Rogue (#542) instead of a 2014 blue Toyota Prius C.
This location now has a 2009 brown Nissan Cube (#473) instead of a 2010 blue Nissan Cube. It may look like the same car, but we've swapped in a 2013 green Fiat 500 (#452) for the previous 2013 green Fiat 500. Find a 2013 red Scion FR-S (#467) instead of a 2013 green Fiat 500. We've placed a 2014 blue Nissan Versa Note (#497) instead of a 2010 red Nissan Versa. A 2013 blue Nissan Sentra (#417) is now located at Oak Bay Junction instead of a 2007 red Toyota Yaris. There's now a 2010 blue Nissan Versa hatch (#310) instead of a 2009 red Toyota Yaris. You'll find a 2011 white Dodge Grand Caravan (#403) instead of a 2009 grey Mazda 5. We've swapped a 2010 blue Honda Insight (#269) for the 2010 silver Honda Insight. There's now a red 2015 Kia Rondo (#677) at Holdom SkyTrain instead a 2009 blue Nissan Cube. There's now a 2015 grey Toyota Prius (#673) instead of a 2014 red Toyota Prius C.
We've temporarily downgraded the Metroplace truck to a 2010 blue Mazda B2300 (#280) while we ready a permanent replacement. You can find a 2014 silver Toyota Prius C (#585) at Telus Garden, 575 West Georgia Street, in the underground parking lot. Enter the parkade from Richards Street, through the small alley next to the Kingston Hotel. At the end of the alley, the parkade entrance is on your right. A 2015 blue Maxda 3 Sport (#592) and 2015 red Fiat 500 Abarth (#586) remain at Stadium SkyTrain until their permanent home is ready. There's now a 2015 blue Fiat 500 (#672) instead of a 2013 green Fiat 500. You can find a 2014 yellow Toyota Prius C (#585) at Lido, 180 Switchmen Street, between Quebec and Main Street. There's now a 2015 Kia Soul (#670) at Athletes' Village instead of a 2011 blue Mazda 2. There's now a 2011 blue Mazda 2 (#321) instead of a 2012 blue Toyota Prius V.
A 2015 grey Nissan Rogue (#583) remains at Main Street SkyTrain until its permanent home is ready. You'll find a 2015 red Kia Rondo (#668) instead of a 2012 blue Dodge Journey. We've placed a 2015 grey Nissan Micra (#662) at W 11th & Trafalgar instead of a 2009 blue Nisan Veresa hatch. A 2015 silver Kia Rondo (#681) now lives here instead of a 2011 white Dodge Grand Caravan. We've swapped a 2015 white Nissan NV200 (#675) at City Hall Surface Lot for the 2014 white Nissan NV200. There's now a 2015 red Toyota Corolla (#660) instead of 2013 blue Toyota Prius C.
A 2015 white Kia Rondo (#679) now lives at this location instead of a 2009 red Dodge Grand Caravan. There's now a 2015 Kia Soul (#669) instead of a 2009 brown Nissan Cube.